What: This is a case study in collaboration with Samsung when I was an exchange student at the National University of Singapore. 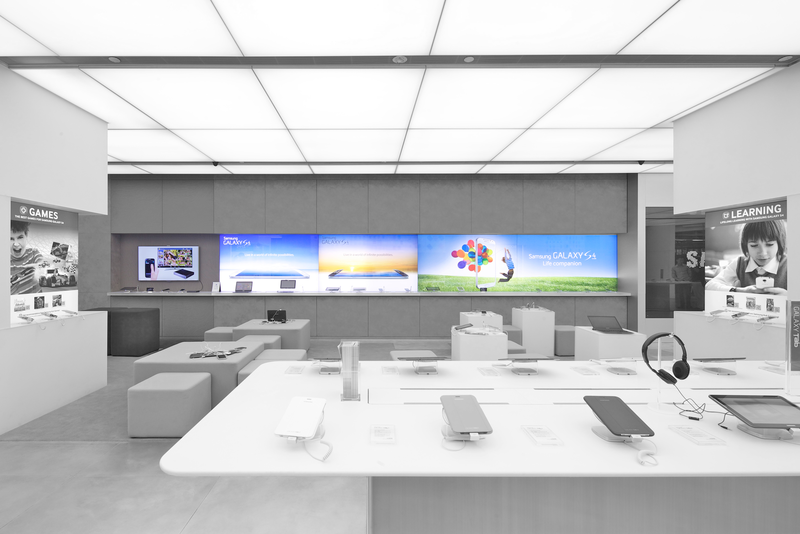 In a group of three, we redesigned the overall online and offline customer experience of the Samsung Experience Store. 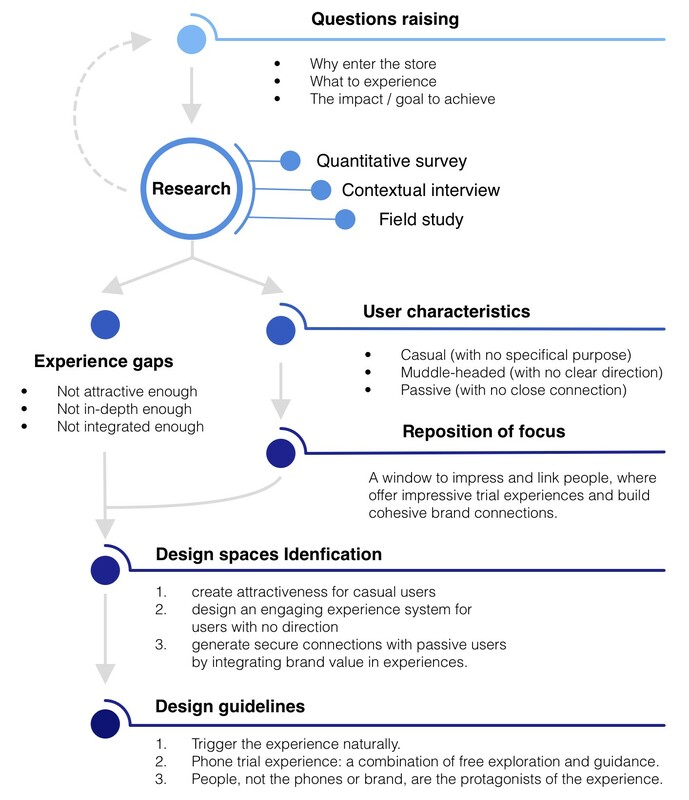 Why we started it: We learned from the research that the focus of the current experience store is not clearly defined, as it cannot provide engaging and interesting experiences, nor can it complete tasks as a retail store. 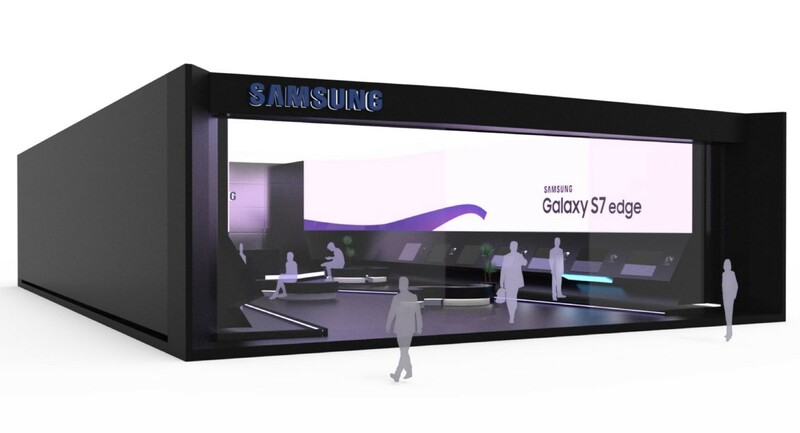 How: After analyzing our research date, we believe the Samsung experience store is not supposed to be focusing on promoting mobile phones directly, but better aimed at offering excellent and impressive experiences. 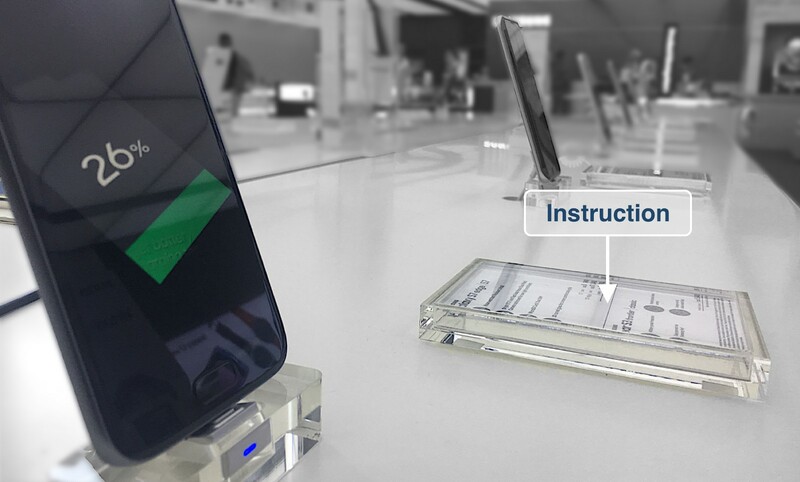 Thus, we designed a new Samsung experience store — the store with a soul, a window to impress and link people. 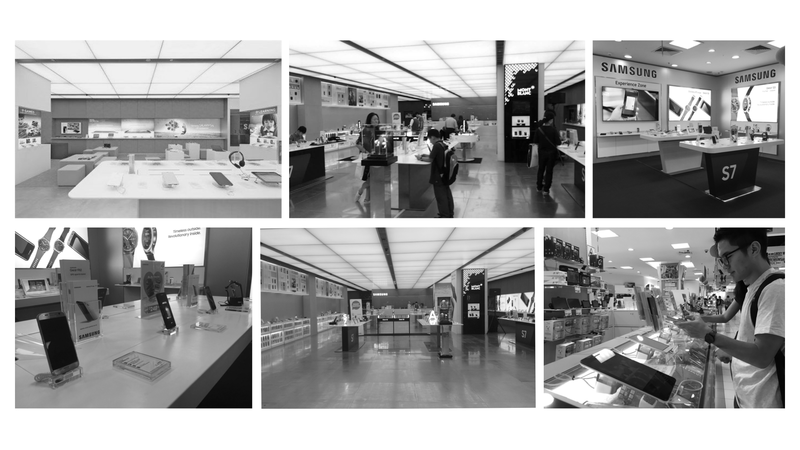 My team selected Samsung Mobile Experience Stores as the design subject and specifically, we conducted a quantitative survey, field studies and contextual inquiries in the Samsung experience store of Vivo City, the busiest shopping mall in Singapore. The entire research process was continuous, but for the convenience of description, I divided the research analysis into two parts. One part is the user-oriented “user study,” and the other part is the service gaps analysis which is more based on field study. Why do people enter the store? What do people want to experience? What can Samsung and its users achieve respectively? In Singapore, people do not typically buy mobile phones in the experience store. According to our survey (127 valid responses), almost every local person bought their phone in telecommunication stores. As telecom contracts bundled with a new mobile phone are more cost-effective, local residents are already used to buying mobile phones by getting a contract. People usually don’t try the phone before buying it. Our survey also showed that only 12.8% of people think it is necessary to experience a new phone before purchasing. And they do not necessarily have to visit the experience store, as various mobile phones can be easily accessed in a telecom store. With neither intention to buy nor to try, why do they enter the experience store? During the observation, it was not a stretch to find someone really in need to experience the phone. For most people, the experience store is just like other shops in the mall — an ordinary place to hang out. “At noon, there are usually more people. After having lunch in the nearby restaurant, some people like strolling around to help digest food or kill time. Expect for people who come here for obtaining sales service or purchasing accessories, most people just want to hang out in the experience store. Honestly, the current experience store can hardly offer engaging experiences. First, people were confused about how to get started. The store is now full of neat white tables, where several phone models stand. 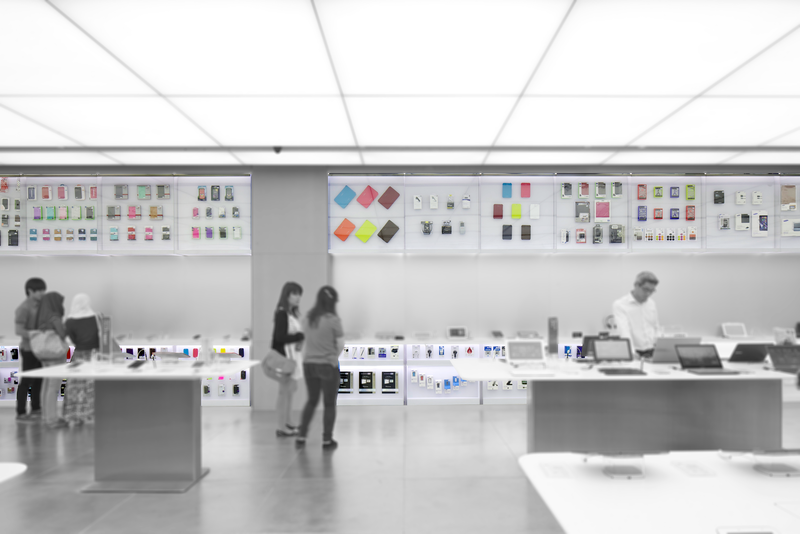 From a distance, the store looks like a “mobile phone gallery”: though elegant, but puzzling. Unless taking a close look at them, people can never tell the differences between those “small black bricks,” so they just navigate their way randomly. Second, people basically have no idea what to do. Not everyone can know how to test a mobile phone like a professional YouTuber who evaluates electronic devices. This is true even for the mobile phone, the most intensively-used devices in modern society. As a result of the quantitative survey, we found that most people have not many specific and clear expectations for the phones they want. Since people don’t know what they want, it’s unreasonable to expect them to know how to experience a new phone. In the observation, I found that people usually pick up a phone for no more than 5 minutes, and the typical process we observed was: pick up the phone → light up the screen → Slide screen back and forth → Open the camera → shoot a picture → put the phone back. OK, it is done. The processes of experiencing a phone of most people are strikingly similar, even for people who claimed they had interests and knew what to test. In fact, their process turned out to be no different. During one context inquiry, a young lady said she values the quality of the photo so much and would like to try some features of the camera. Nevertheless, what she was going to is merely taking several photos of the interior decoration in default mode. When asked what does she think about the camera, she concluded: “the photo is clear” but cannot explain more. Users always say one thing but do it differently. People don’t seem to care so much about mobile phone brands as I imagined before. In our survey, 50.8% of people indicated that they choose a brand because of their habit, their inertia. Indeed, the phone of their familiar brand means few or no unaccustomed operation. However, except for the design or brand value, most of the reasons can be viewed as passive and indirect. In other words, general public users don’t have their own positive, active and direct perception of the product and the brand. So when it comes to the question that if they are willing to try a different brand next time, it is not surprising to find 88.5% of them gave a positive answer. There are no firm connections between the brand and the customers now. Gone are the days of Samsung is the only preeminent choice for Android mobile phones, which means Samsung may be no longer able to retain its users as easy as before. However, this risk can also be an opportunity as well, if Samsung can develop close connections with a considerable amount of existing users, and finally turn users into fans. Almost all Singaporeans choose to buy a new phone in the telecom store rather than in the experience store, which is an entrenched and seemingly intractable habit associated with the local market environment. Considering that, experience stores should no longer be viewed in the traditional sense as a channel for selling. I’m not promoting not selling smartphones but selling them in another way. It is wiser to concentrate on creating novel, gripping and memorable phone trial experience, and further deliver a favorable impression. And for people who are already Samsung users, Samsung must be not comfortable with their indifferent and neutral relationship with the brand. It’s time to build close and various connections with Samsung users. As a result, we redefined the experience store — A window to impress and link people, by offering impressive experiences, and building cohesive connections. In the field study, I found lots of unsatisfactory experience gaps. However, a good design does not mean filling in these gaps one by one. Separate experience gaps need to be organized and refined to identify our main design spaces. We first look into a ground factor of user experience — engagement. Hierarchy of Engagement has three levels: 1) Growing engaged users, 2) Retaining users, and 3) Self-perpetuating. 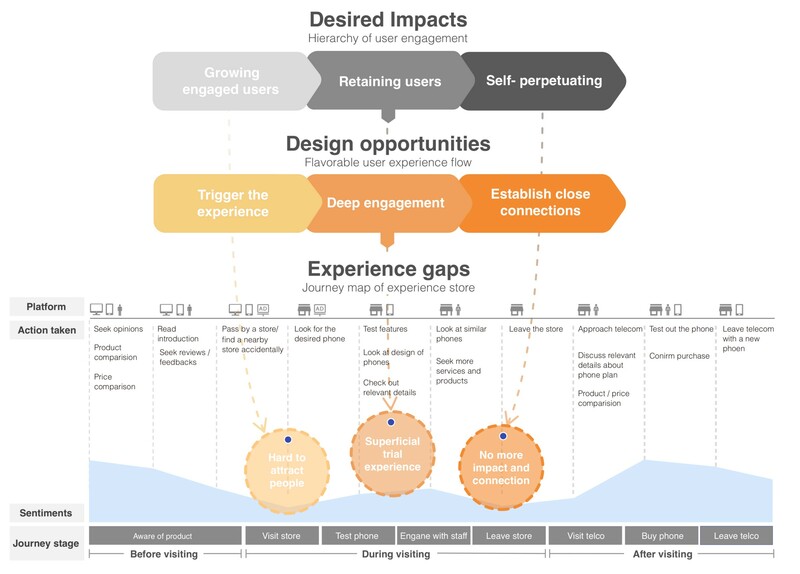 And In the field of UX, they can be reworded as 1) Trigger the experience 2) deep engagement, and 3) Establish close connections. Few of passerby we observed would stop by and enter the store, even though we noticed that a considerable proportion of them had at least a glance at the ads (videos and posters) in front of the store. The reason is that these ads are not inviting, unique and Personalized enough. These Advertisements are so common in shopping malls and can be seen everywhere. Also, Ads only want to seize people’s attention and then pass information to them, but do not react to their responses. It is quite common for a customer starts watching a commercial video that has already been played halfway. But since several videos will loop automatically, he may need to wait till the entire loop finished to find out what he missed. So while advertisings can attract people to glance at or stop to watch, they failed to attract people in. “Hanging around” doesn’t equal to “making decisions completely randomly.” Though people seem to be aimless, there is certainly a direct but potentially undetectable “reason” to lead passersby to enter the store. Current Advertising in the store can hardly grasp people’s points of interest and further turn them into a curiosity to explore. This means that we need to awake their curiosity, stimulate their passion, and create the “reason” for the user in a short time. An appealing beginning of the story means half the battle. We desire to create excitements at the beginning of the experience, prompting our customers to explore more experiences actively. It is hard to engage people in a deeper and broader phone trial experience, whether guided by staff or explored by the user themselves. It is unrealistic to expect a clerk to be a person who can understand each person in a short conversation. Also, people seem to be a little bit uneasy about the enthusiasm of the clerks. About 70% of people would be looking around by themselves unless they have questions that cannot solve by themselves. I also learned the same fact from the staff. For customers who just want to hang out here, I generally don’t ask if they need help as they may feel pressured and then leave soon. Next to each phone, there is a card written on only basic technical information and advantageous features of this model. Apart from this small card, people can not rely on anything else to assist their self-exploration process. How to engage people in a broader and deeper experience? How to appropriately balance self-exploration with guidance and help? How can we incorporate various exciting point in different user’s experience? Only after finding answers to these questions can we confidently claimed that this is an “experience” store. People experience quickly and leave quickly. After people putting the phone back in the deck, there are no tips or hints leading people to more relevant experiences or services, so customers need to take the initiative to explore and try more. So usually, they just leave directly. People are confused about how to use other “experience areas”, so they don’t try it. I found that except the phone trial area, the experience store affords quite a lot “experience areas,” such as Virtual reality zone, accessories zone, Family/Kids apps zone, and even a coffee bar. However, no conspicuous mark or visual boundary indicate they have different functions. It requires staff assistance to experience the VR zone, while staff usually stand on the other end of the store. The lounge is only just for rest as people cannot experience anything there. This discovery informed me of the abundant design opportunities hidden between and after the phone trial experience, where we build connections with customers. Knit the whole experience in the store with threads — the brand values. In telecom stores, every single mobile phone is separate, waiting to promote itself, while in the experience store, what we are craving to “sell” is the brand. We hope the experiences on each mobile phone is able to be closely knitted and then become a thread to connect with the customer and pass the brand value to them. We hope that leaving the store does not mean the end of an experience, but the start of a new connection or different experience. Though people are less likely to buy something, we are long for creating bonds that tie the Samsung and its user. Once the design spaces are clarified, we then created some design guidelines except the main tasks of our design spaces, reminding us of several principles of equal importance. Those guidelines can help us to generate a proper design with the value we are striving for. 1. Trigger the experience naturally. Though it seems great to create excitement for customers at the beginning of the experience, we have to ensure that the surprises are not scaring or irritating. 2. Phone trial experience: a combination of free exploration and guidance. Having an in-depth experience doesn’t mean there is only one way or one path to lead the experience. On the contrary, relatively free exploration environment can facilitate users’ curiosity better. 3. People, not the phones or brand, are the protagonists of the experience. Since we are desired to establish connections with our users, it is easy to fall into a mentality that we can’t wait to show the merits of the brand in every single design point. So we must ensure that the starting and ending points of all design points fall on the user. For the Samsung experience store, the three most significant problems are that the experience there is 1. Not attractive enough 2.Not in-depth enough and 3. Not integrated enough. After redetermining the emphasis of the experience store to be impressive experience and cohesive connections, we uncovered three correspondingly design spaces where we devote to 1. create attractiveness for casual users 2. design an engaging experience system for users with no direction and 3. generate secure connections with passive users by integrating brand value in experiences. 1.How to reach valuable insights from the scattered date of the questionnaire. Try to classify the data by keywords, user’s sentiment orientation, different action stages, and then tie the questions in one category together to analysis. 2. How to decide the main finding and insights by synthesizing the results of various research methods. I am not in a hurry to find a common point from interviews, observations, and questionnaires, but go back to the starting point: revising the primary questions. Then I match every result with the questions to conduct subdivision analysis. 3. How to present the results of research. There is no fixed presentation method for the conclusion of the survey, as long as the necessity is displayed clearly. I didn’t create a persona to describe who we are designed for, as it contains too much distracting information.